NEW HAVEN, CONNECTICUT. - This summer, the Yale Center for British Art renowned for its collection of works by 18th- and 19th-century British artists will present an exhibition of paintings, watercolors, prints, drawings, and manuscripts by one of the most neglected British artists of the Romantic period. "The Art of James Ward", on view through August 22, 2004, will feature more than 30 paintings and 60 works on paper, drawn almost entirely from the collections of the Yale Center for British Art. At the height of his career, James Ward, R.A. (1769-1859) was known as the "Mammoth of animal painters." His reputation rose so high in the Regency period that his client, Lord Fitzwilliam, predicted that posterity would eventually say that "Milton was born near James Ward, and not Ward near Milton." It is a measure of the artist’s vanity that Ward told this story about himself. That vanity was kindled by the opportunities that came during Ward’s early career as a member of the Royal Academy of Arts (R.A.). At the end of the eighteenth century, the R.A. was still a relatively young organization that offered Ward and other animal painters large audiences and new clients, and kindled a variety of aspirations. Prior to his membership in the R.A., Ward had emerged from his impoverished youth as a brittle, pious, and argumentative young man with incredible talents. Early on, he learned the process of mezzotint from his brother William, an engraver. Through the influence of his brother-in-law, the artist George Morland, Ward found his way to oil painting. He later became devoted to the painting techniques of Rubens and Van Dyck, as well as to the careful study of nature through drawing, and copying fragments of ancient sculpture, including the Elgin marbles. 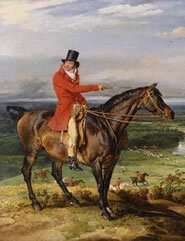 Ward achieved great success with his animal portraits, some of which became famous through prints, particularly the paintings of the horses Marengo and Copenhagen, who belonged, respectively, to Napoleon and the Duke of Wellington. Those paintings are today in the collection of the Duke of Northumberland. Ward survived a professional setback when his grand allegory of the Battle of Waterloo was deemed a colossal failure. He soon rallied and went on to enjoy continued prosperity, living extravagantly and working well into the mid-nineteenth century. Toward the end of his life, however, his style of painting fell out of fashion; he encountered financial troubles and collided unhappily with the Pre-Raphaelites. He died in his ninetieth year a disappointed man. Today James Ward is remembered as a key painter in the British Romantic tradition, and certain of his paintings, such as his enormous "Gordale Scar" (Tate Gallery), are among the most important manifestations of Regency gigantism and the widespread taste for the sublime. This exhibition takes advantage of the depth and range of the Center’s collection of more than 280 works by James Ward, presenting his work according to the principal subgenres in which he excelled. These include livestock, horse, and dog portraits; other studies of wild or domestic animals, such as bats, ferrets, and swine; sporting or hunting pictures; sublime and picturesque landscapes; rustic subjects (both human and topographical); and portraits, as well as history, religious, and allegorical studies. The Center is the only venue for "The Art of James Ward", which has been organized by Angus Trumble, Curator of Paintings and Sculpture, Yale Center for British Art. An accompanying publication, edited by Angus Trumble, with an introduction by Edward J. Nygren, will be available at the Museum Shop.